Audio Downloads from our successful Ask the Experts teleseminar series. With so many great audios available, we know you will be interested in more than one! Add three titles to your cart and use coupon code "bundle" at checkout! with Dr. Steve Gilligan and Maggie Phillips, Ph.D.
Or - three audio downloads for $79! with Dr. Eric Greenleaf and Maggie Phillips, Ph.D.
with Dr. Michael Yapko and Maggie Phillips, Ph.D.
Dr. Michael Yapko is an extraordinary presenter in the area of depression (and many other topics too). One thing you may not know about Michael is that he consults for the San Diego zoo. As you might imagine, working with elephants and other animals with “behavioral issues” really takes a lot of skill. Please learn more about Michael at www.yapko.com. with Dr. Carol Look and Maggie Phillips, Ph.D.
Dr. Carol Look is an internationally recognized expert in the field of Energy Psychology, especially EFT. She is the author of two of the field’s classic EFT training manuals, How to Lose Weight with Energy Therapy and Quit Smoking Now with Energy Therapy. For more information on Carol, her books, and training programs, go to www.attractingabundance.com. with Dr. Peter Levine and Maggie Phillips, Ph.D.
Dr. Peter Levine is the creator of the Somatic Experiencing® method of healing trauma and author of the landmark book, Waking the Tiger: Healing Trauma, as well as 5 more recent books and CD programs. 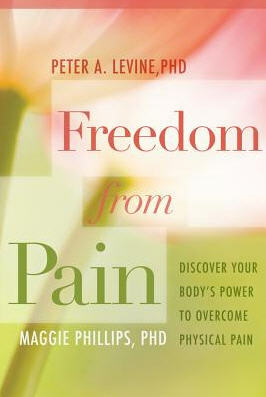 For more information on Peter, his books, and his training program, go to www.traumahealing.com. with Brother David Steindl-Rast and Maggie Phillips, Ph.D. Brother David Steindl-Rast, Benedictine monk, author, spiritual teacher, and expert in gratefulness, will co-present with Dr. Phillips on "Pathways to Gratefulness." To learn more about Brother David see www.gratefulness.org/brotherdavid/index.htm. The questions that matter to you. with Dr. Bruce Eimer and Maggie Phillips, Ph.D.
Dr. Bruce Eimer is author of Hypnotize Yourself Out of Pain Now! To learn more about why Dr. Phillips invited him to be her next teleseminar expert to address the topic of chronic pain reversal, please visit Dr. Eimer's websites: www.HypnosisHelpCenter.net and www.bestWayToStop.com. • Topics important to you. with Dr. Laurel Parnell and Maggie Phillips, Ph.D.
Dr. Laurel Parnell has authored four books on EMDR, and in this teleseminar she will be presenting from her latest book,Tapping In: A Step-by-Step Guide to Activating Your Healing Resources Through Bilateral Stimulation. To learn more about Dr. Parnell, please visit her website at www.emdrinfo.com. In this teleseminar, we will review the major mechanisms of pain including the interface between trauma and pain, the dynamics of the central nervous system, the common pathways of emotional and physical pain, the role of relational trauma in emotional pain, and distinctions between pain and suffering. Specific techniques based on EMDR and the "Tapping In Tapping Through" model proposed by Dr. Laurel Parnell will be discussed. This approach can be used to help re balance the nervous system, provide rapid pain relief, activate the parasympathetic restoration cycle, and teach self-regulation. with Dr. Robert Scaer and Maggie Phillips, Ph.D.
Robert Scaer has written two outstanding books on trauma. The first, The Body Bears the Burden, explores the impact of traumatic stress on all of the systems of the body. The evolution from health to the formation of chronic syndromes, including chronic pain, is explained in an informative, easy-to-read style. In his more recent award-winning book, The Trauma Spectrum: Hidden Wounds and Human Resiliency, Robert writes about the cumulative impact of negative experiences over the lifespan, expanding our understandings about how trauma restricts our health and enjoyment of daily life. If you don’t know Robert Scaer's work, please visit his website: www.traumasoma.com. with Dr. Neil Fiore and Maggie Phillips, Ph.D.
Dr. Neil Fiore has written two successful books, Awakening Your Strongest Self and The Now Habit. To get more information about Neil’s work, visit www.neilfiore.com, and www.neilfiore.blogspot.com. with Dr. Marty Rossman and Maggie Phillips, Ph.D.
Dr. Marty Rossman, MD has long been a pioneer in the area of interactive guided imagery. In this teleseminar, we will be focusing on recent breakthroughs in this evidence-based treatment modality for chronic pain. Please visit www.thehealingmind.org and www.academyforguidedimagery.com to see why Marty Rossman is a speaker that you won't want to miss. This audio is for anyone interested in learning about how to heal chronic pain conditions. Whether or not you have a pain condition, whether you love or care about someone in pain and are looking for ways to support them, or whether you are a professional who treats pain, you will find effective information and strategies you can try out right away that will make a significant difference. with Dr. Fred P. Gallo and Maggie Phillips, Ph.D.
Dr. Fred Gallo is the author of seven books on energy psychology, including his most recent book, Energy Tapping for Trauma. For more information, please visit www.energypsych.com to find out why he is one of my top choices to help you learn effective tools with chronic pain. If you’ve been curious about Energy Psychology, this is the call for you! If you have studied Energy Psychology methods but want to learn how to apply these techniques more effectively to the treatment of pain, this call is also designed especially for you! Upon placing a successful order, you will receive email detailing next steps. Dr. Phillips speaks on Reversing Chronic Pain with Energy Psychology (interviewed for Voice America by Carol Look) click here. You Tube video click here. 10 Ways to Stop Pain Before it Stops You! I know Dr Phillips and recommend anything she teaches, she is so knowledgeable, so diligent and caring about getting spreading the word on how to resolve trauma, which is very needed in our world today. Single-handedly she has done so much to help the world. I love Dr Phillips and am thankful for her work. © 2012 Reversing Chronic Pain Online, Maggie Phillips Ph.D., All rights reserved. This material may not be published, reproduced, broadcast, rewritten, or redistributed without permission. Use of this site constitutes acceptance of our terms and conditions.